Participant : Graduates of Electrical and Computer Engineering and others interested in computer engineering. The 2017 seminar series for School of Electrical and Computer Engineering is scheduled to be held at UNIST on March 8, 2017. 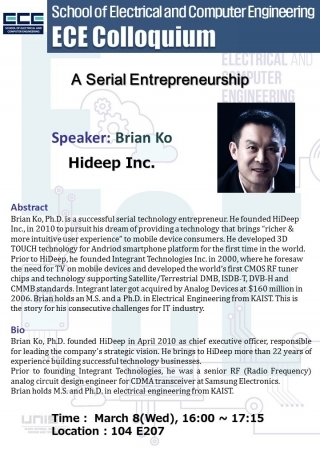 The speaker of this seminar is Dr. Brian Ko from Hideep Inc., presenting “A Serial Entrepreneurship”.